Preheat oven to 180C/gas 4. Heat 2 tbsp oil in a large pan and add onion and garlic, cook till just soft. Add tomatoes, mushrooms, tomato puree, breadcrumbs, feta, stock cube and cook for 10 minutes. Taste and season as required. Remove from heat, add basil. Fry aubergines in remaining oil until soft and lightly browned. 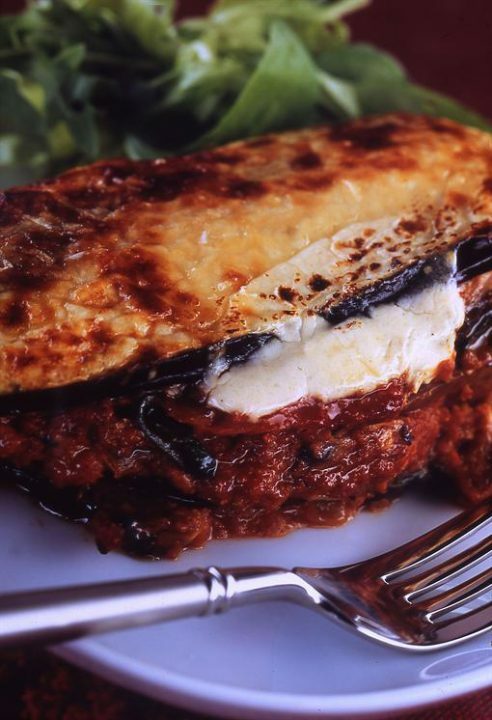 Lightly grease a 2 litre/3½ pint ovenproof dish and line the base with 1/3 of the aubergine slices. Add a layer of the tomato mixture and repeat, and then finish with a layer of aubergine. Combine the remaining ingredients except the parmesan, pour on top of the aubergine and spread out with a spatula. Sprinkle on parmesan and place in oven for about 45 minutes until top is golden and the sauce is bubbling at the edges. Serve with a crisp green salad.